These candle holders are perfect for lighting up your dinner party or as a decorative piece for your table or shelf. They make wonderful gifts! They can be used with a tea light or other small candle. Each holder is wheel-thrown in Porcelain. 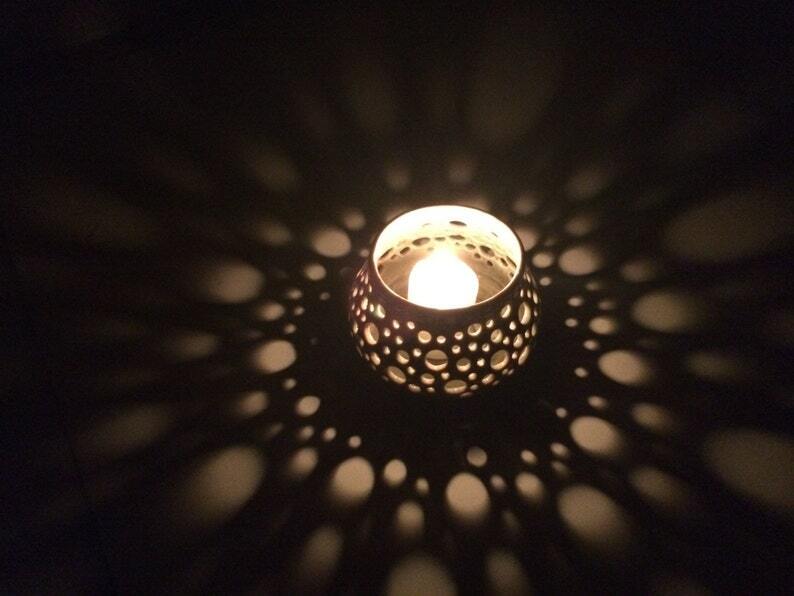 The holes are pierced by hand in a unique pattern that casts a beautiful shadow on the table when a candle is lit. You choose the glaze color. GIFT READY... comes with a candle! If you have any questions about color, please send me a message. If you are interested in more than two, contact me before ordering and I can give you a better shipping price depending on your location. NOTE: Each holder is handmade and will vary slightly in shape and size. They are all around 4 inches wide and between 3 and four inches high. The pictures are representational of what you will receive, but no two holders are exactly alike, and there will be natural variations in color that make each one unique.